Further development includes signal extraction algorithms for biological age classification (BioTrace). This became a success due to the extension work on underwater current flow that was very similar to blood flow in the body. The MFPT approaches and strategies became important. The challenge has to do with the separation of the first and second “pulse”, its shape, position and height. The main pressure wave when the heart is pumping blood into the system. The reflected pulse due to the flexibility of the arteries. 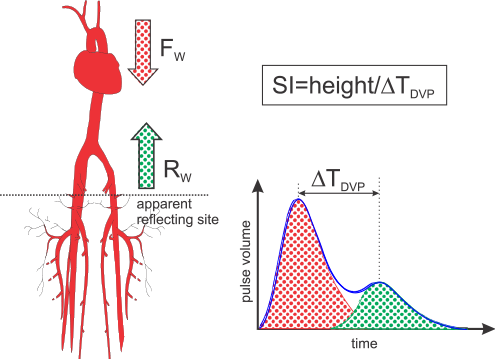 The second reflected pulse is smaller but its value and position will offer key information relative to arterial health. The more flexible the arteries, the healthier the person is and the lower their biological age is. In the figure, Fw is the main pressure wave and Rw is the reflected wave. The DVP shape, which is related to the latency and amplitude of the second wave, changes with the actual “biological age”. When the arteries are “young,” the two waves are typically well separated. When the individual is older, the two waves come closer together and it is more difficult to separate them. For more information on products that will help improve your arteries, please visit Embla Global. The two main products are Cardio Care and Cardio Pro.